Team CMA visited Molson Coors Brewery as part of its Industrial Visit on November 3, 2017. The brewery had an upper cap on the number delegates due to safety reasons. Meeting the cap 35 members of the Chandigarh Management Association. 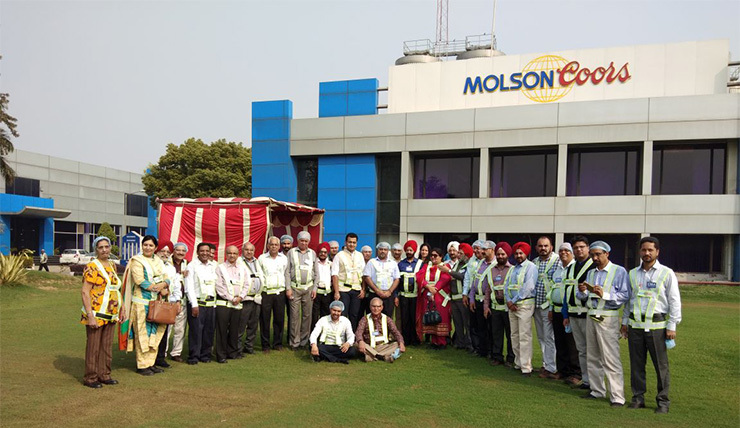 Molson Coors Brewery, Punjab is one of the popular Brewery located in Bhankarpur, Dera Basi, near Chandigarh. A global market leader, (World’s 3rd Biggest Brand in Beer) the Company has a rich legacy of more than three centuries dating back to 1774. It brews, markets and sells a portfolio of leading premium brands such as Coors Light, Molson Canadian, Carling, Staropramen and Blue Moon across the Americas, Europe and Asia. In April 2015, Molson Coors acquired Mount Shivalik Breweries Ltd (MSBL). As a result, MSBL’s entire brand portfolio, including the leading strong beer brand, Thunderbolt, became a part of Molson Coors in India. The member delegation learnt about the ingredients (water, yeast, hops barley) and the process of brewing that involves malting, mashing and boiling, fermenting, aging and packaging. Their General Manager and Human Resources Manager gave us an overview of the manufacturing plant, it’s issues and future stakes in the market.